In this post, I summarize all that I have learned about the actual test scores of different income levels. In particular, I compare actual psychometric data of seven U.S. economic classes: (1) the homeless, (2) welfare recipients, (3) median Americans, (4) self-made millionaires (5) self-made decamillionaires, (6) self-made billionaires, and (7) self-made decabillionaires, and largely confirm my repeated assertion that average IQ increases by 8-10 points for every ten-fold increase in income, though there may be a few major exceptions to this overall trend. 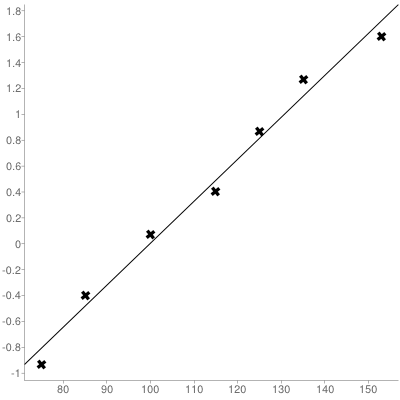 Also, by analyzing the slope of the standardized regression line predicting IQ from income, I find evidence that the true correlation between IQ and income (at least in America) is much higher than the 0.23 reported in a 2006 meta-analysis and even higher than the 0.4 correlation asserted by Arthur Jensen, and may even approach 0.5. I also find tentative but shocking evidence that the IQ gap between the richest and poorest Americans may exceed an astonishing 70 points! In this analysis I am limiting myself entirely to test score data so IQ estimates based on ethnic composition or educational achievements of various economic classes are only occasionally mentioned to buttress the actual psychometric results. In several cases, the data is somewhat anecdotal, and speculative statistical inferences are sometimes made. For each economic class, I provide two normalized Z scores; one measuring the median financial success, and one measuring the mean or median cognitive ability. The normalized Z scores are just measures of where each economic class ranks (in financial success or IQ) compared to a reference group (in this case U.S. adults in general, or U.S. adults of a specific age). For example a Z of +2.33 means you’re in the top 1%, and a Z of -2.33 means you’re in the bottom 1%. A Z of 0 means you’re right in the middle, etc. A 2004 study found that 90 homeless men living in a large shelter in Milwaukee, Wisconsin, had a mean WASI full-scale IQ of 83.92 (standard deviation = 15.24). The WASI was published in 1999, and this study was published in 2004, so we should subtract 1.5 points for old norms which are thought to expire at a rate of 0.3 points a year (the Flynn effect), so the homeless likely have a mean IQ of 82.5 (U.S. norms) or about 80 (U.S. white norms). One problem with this study is that 81% of the sample was black (much higher than the 45% among homeless Americans in general) and these tend to score lower on IQ tests, at least in the general population, however a UK sample of homeless obtained virtually identical scores on the WASI, despite being 96% white. In the UK study, the WASI full-scale IQ distribution of the homeless has a mean of 84.3. In this study, published in 2011, the WASI norms were by now even more outdated, so we should probably subtract 3.6 points for old norms, so this homeless sample have a mean IQ of 80.7 (U.S. norms) or about 78 (U.S. white norms). Given the IQ of 80.7 (U.S. norms) among the the virtually all-white U.K. homeless sample, the IQ of 82.5 among the mostly blacks American sample is unlikely to be deflated by race, thus 83 is considered the best estimate of the American homeless. About 17% of U.S. adults between age 18 and 64 receive public assistance. Thus the median welfare recipient can be thought of as in the bottom 8.5% financially. It’s common knowledge in psychometric circles that reading comprehension tests are statistically equivalent to IQ tests, and a literacy study found that about 2/3 to 3/4 of adult welfare recipients (about 71%) have what’s classified as Level 1 or Level 2 literacy. By contrast, 1/2 of the general adult population are at these levels. Since by definition, 1/2 of Americans have IQs below 100, it can be deduced that 71% of welfare recipients have IQs below 100. In a normal distribution, the 71 percentile is 8 IQ points (0.53 sigma) above the mean, so if IQ 100 is the 71 percentile among welfare recipients, the average welfare recipient should have an IQ 8 points less. In other words, American welfare recipients average IQ 92 (U.S. norms) or about 90 (U.S. white norms). Some might object that my analysis falsely assumes welfare recipients have the same IQ variance as the general U.S. population, but the above cited studies of the homeless suggest that poor Americans do indeed have a similar variance to Americans on the whole. By definition, the median American is at the 50th percentile financially. By definition, the median American is at the 50th percentile cognitively. The average self-reported SAT score of the millionaires Stanley survey was 1190, which Stanley adjusted to about 1100 because of self-reporting bias (millionaires who were “A students” were more likely to recall their scores than “C students”). Since 90% of the sample were college graduates it’s likely virtually all took the SAT. Since the typical self-made millionaire in the sample was 54 as of 1998, it’s likely he took the SAT circa 1961 (when he was 17). According to the book The Bell Curve (page 422), if all American young adults (not just the college bound elite) had taken the SAT in 1960, the average score (IQ 100; U.S. norms) would have been 784. Meanwhile prior to 1974, an SAT score of 1300 was considered Mensa level (IQ 130). Extrapolating from these two data points, the average self-made millionaire has an IQ of 118 (U.S. norms); 117 (U.S. white norms). 20% of Stanley’s millionaire sample earned at least $1 million a year in household income, and many of these probably earned much more than that, and presumably the bulk of this was individual income made by by the head of households Stanley surveyed, not their spouses. Anyone in their 50s who has been earning a million a year for a long period of time, likely has, or will have, a net worth over $10 million (decamillionaire status). In the year 1998 (when the millionaires were surveyed), it took an individual income of about $1.25 million to make the top 0.1% for 52-58-year-olds. 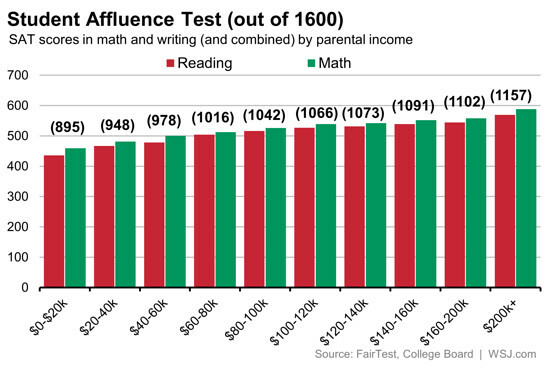 Above I noted that millionaires had a mean SAT score equating to IQ 118 (U.S. norms); 117 (U.S. white norms). Because Stanley found virtually no correlation between income or net-worth among the millionaires themselves it might be assumed that the decamillionaires in his sample also averaged IQ 118. Of course if the data was not normalized, the zero correlation might be misleading. About 80 million Americans were born between 1946 and 1964 (the baby boomers). People in this age groups are about 42% of the richest Americans. There are 277 self-made billionaires in America (see appendix A of this document). If we assume 42% of these are boomers, then 116 of America’s 80 million boomers are self-made billionaires, which means the median self-made billionaire boomer is the 58th most prosperous out of 80 million, equating to the 99.99993 percentile. Several boomer billionaires have SAT scores that are apparently publicly known. Bill Gates claims to have scored 1590 and Paul Allen reportedly scored 1600. On the pre-1995 SAT, these scores equate to IQs of about 170. I can no longer find any internet sources reporting Steve Ballmer’s composite SAT scores, but he reportedly scored a perfect 800 on the math section of the SAT which seems to equate to an IQ of 150, but given that he hit the ceiling on the test, and is rumored to be in the same IQ league as Gates himself, this is likely an underestimate. Perhaps the best publicly known measure of his IQ is his performance on William Lowell Putnam Mathematical Competition where he performed even better than Gates. If this source is reliable, Ballmer got one of the 100 best scores on the exam in 1974, but probably not one of the top 45, so let’s split the difference and assume he came in 73rd. Ballmer was one of the 4,308,000 Americans born in 1956, and assuming almost all of the top math talent from his cohort went on to compete in the 1974 Putman (and whatever shortfall was made up by top foreign talent and by older and younger talent), then Ballmer’s score equates to the top 73 out of 4,308,000 (one in 59,000 level) which equates to an IQ of 162. Thus at least three of the roughly 116 self-made boomer billionaires in America (2.6%) have tested IQ equivalents of at least 162+. It’s possible some of these scores have been exaggerated, but it’s also possible there are other super brilliant self-made billionaires whose choose to keep their high test scores secret. Both possibilities negate one another, making 2.6% perhaps a reasonable estimate. In the general U.S. population, the top 2.6% have IQs of 129+, but in the self-made boomer billionaire population, the top 2.6% have IQs of 162+. 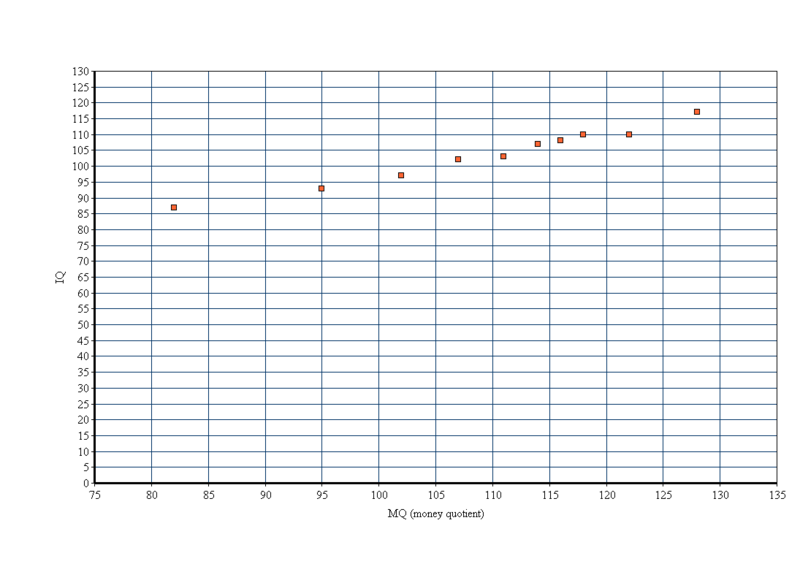 This suggests their entire bell curve is shifted 33 IQ points to the right, so just as the average American has an IQ of 100, the average self-made boomer billionaire should have an IQ of 133, though given that the average is extrapolated from just three outliers (Gates, Allen and Ballmer) who all got rich from one company (Microsoft), it should be interpreted with great caution. Nonetheless, it is roughly consistent with research showing that 43% of self-made billionaires attended colleges indicative of top 1% ability (IQ 135+) (see table 1 of this document) and is also roughly consistent with the ethnic composition of the Forbes 400 richest American list, though there are some anomalies. Some might object that my estimate for the average IQ of self-made boomer billionaires assumes the super rich have the same IQ variance as the general U.S. population, however a study of the homeless (cited way above) found that even folks at the economic extreme have a standard deviation of 15, like Americans as a whole. Of the 13 self-made decabillionaire boomers, at least three (23%) reportedly have test scores equating to IQs of 162+ (Gates, Allen and Ballmer as mentioned above). If we assume that the IQs of self-made decabillionaire boomers are roughly normally distributed with the same variance as in the general U.S. population (see above), then the fact that 23% have 162+ IQs implies an average IQ of 151, though given the small number of data points, this could just be a fluke. But it’s worth noting that self-made decabillionaires have perhaps roughly double the rate of elite college attendance as U.S. self-made billionaires in general. Futher, when I analyzed the ethnic and racial background of self-made decabillionaires in 2009 (all generations) it implied a mean IQ of about 150. Despite this corroboration, an IQ of 151 is so incredibly high that it should still be considered tentative. And even assuming its veracity, it may only apply to decabillionaires of the baby boomer cohort and younger. Older decabillionaires came of age before the rise of high tech and big data, and thus may not have needed anywhere near as much IQ to get rich. One might not think an IQ of 151 is that extreme for elites given that SAT IQ equivalents this high are not uncommon at the most elite colleges in America, however it’s worth repeating yet again that the IQs of elite college students will regress precipitously when they move from the SAT (the test that selected them) to a neutral IQ test. By contrast, decabillionaires were mostly selected by the market, and only partly by their SAT scores creating opportunities, so unlike Ivy League students, their SAT IQ equivalents are perhaps not inflated by selection bias. Below is a summary of the above data in table form. The simplest way to think of the IQ income relationship is that for every ten-fold increase in income, average IQ increases 8-10 points (U.S. white norms). Of course there are some major anomalies. Self-made decabillionaires are 10 times more prosperous than self-made billionaires, yet appear to score 19 IQ points higher, though these numbers are tentative given limited data. Meanwhile self-made decamillionaires are ten times more prosperous than self-made millionaires, yet appear, based on Thomas Stanley’s research, to be equally intelligent. One possible reason for this is that the the correlation between IQ and money is partly mediated by years of education, but once you have enough education to be a millionaire (i.e. law school or medical school), even more schooling doesn’t help much. and may even have opportunity costs. As the above graph shows, there’s a virtually perfect (r = +0.97) correlation between economic class and mean/median measured intelligence, when both variables are expressed as normalized Z scores. Note, this near-perfect correlation between median financial success and mean IQ should not be confused with the correlation between individual IQ and individual financial success. The former is known as as an “ecological” correlation commonly used in epidemiological research, and tends to be higher because individual level variation cancels outs. However because the Z scores are based on the normalized distributions of individuals, the slope of the regression line (+0.49) will equal the individual level correlation. 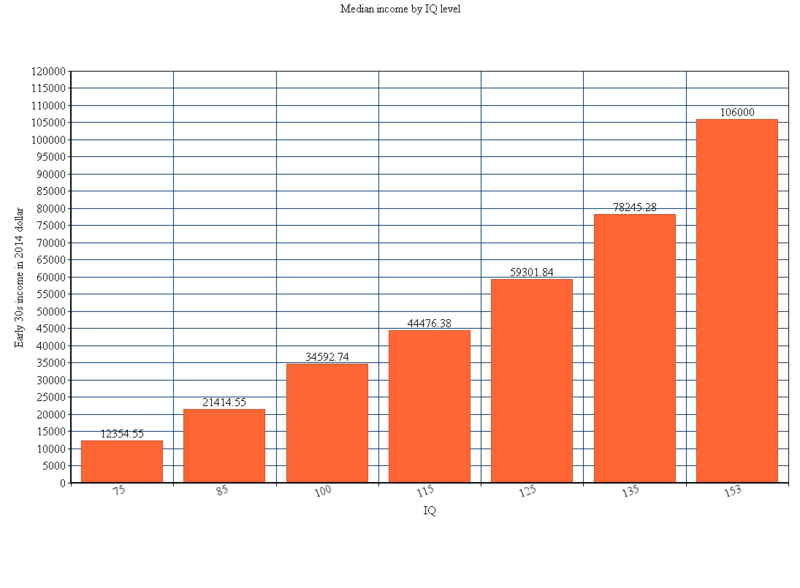 Notice first that the range of Z scores on both the X and Y and axis is much less. That’s because most people in a random sample of Americans are ordinary in both income and IQ. Note also the enormous variation around the line of best fit. Now if you extended the range of X and Y much much further, and if you plotted the mean Y for every X, instead of every Y for every X, you should get a scatter plot that looks very much like the ecological scatter plot. 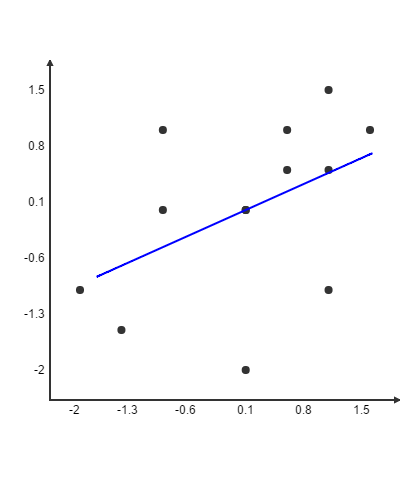 But note that in both the the ecological scatter plot, and the individual scatter plot, the slope should be the same because the line of best fit can be thought of as a line connecting the average Y of a given X, so graphing average Ys instead of individual Ys, does not change the line of best fit, it simply eliminates almost all the scatter around it. 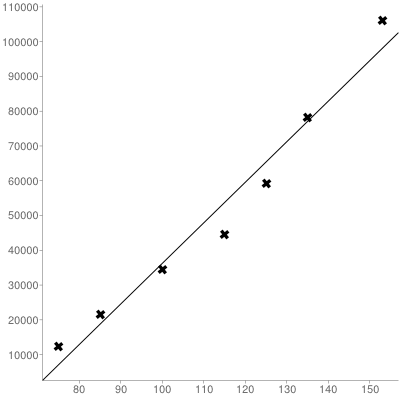 A correlation of 0.49 is more than double the 0.23 correlation between IQ and income reported in a 2006 meta-analysis by Tarmo Strenze and nearly triple the 0.16 correlation between IQ and net-worth found in a 2007 study by Jay L Zagorsky, however it is similar to the 0.4 correlation between IQ and income asserted by authoritative Arthur Jensen in his 1998 book The g Factor. Why did my indirect method (regression slope analysis) result in double the correlation found by Strenze’s meta-analysis of direct studies of IQ and income? Many studies are based on individual income instead of household income. Because many women (and some men) choose not to work outside the home, their individual incomes are technically zero, but they should not be considered the equivalent to a homeless person with zero income, because they are in fact working in the home and thus earning at least some of their household income. Because there’s no agreement on how to quantify such indirect forms of income, it’s not counted which greatly limits the IQ-income correlation. 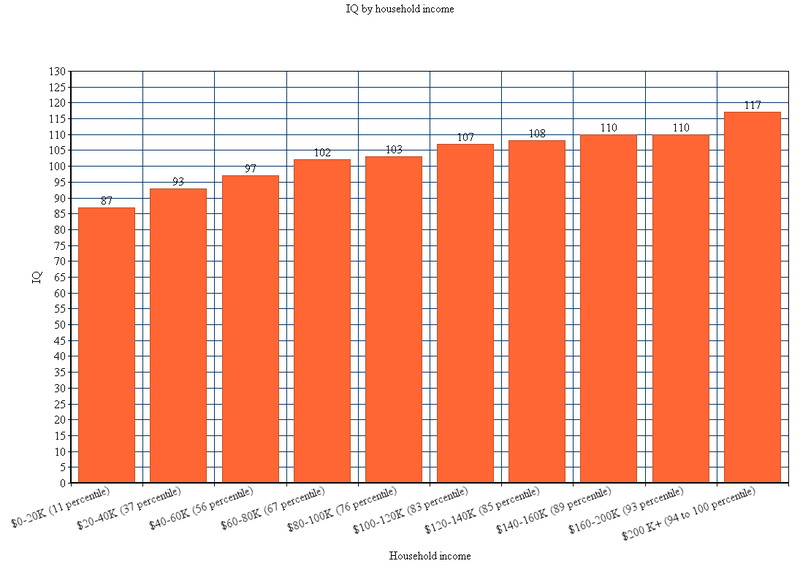 Using household income instead of individual income seems to result in a higher correlation between IQ and income (+0.37) but even this is an imperfect solution, because all adults within a household don’t contribute equally to the household income. In addition, many studies use only a single year’s income which is obviously quite unreliable, since massive income fluctuations can occur from year to year. In my analysis, both of these problems were sidestepped because data points were collected primarily from head of households (self-made millionaires, self-made billionaires) or non-households (the homeless) so you didn’t have to worry about how to deal with indirect income (i.e. the spouse of a millionaire who technically earns nothing, but earns her million dollar life by being a good wife). Also, my analysis focused on fairly stable economic classes (homeless, welfare, millionaires, billionaires) that reflect lifelong patterns of financial success, and not just a single year’s income. All this may explain why I found a much higher IQ-income correlation than is usually reported. A reader informed me of an excellent analysis by Dalliard of Human Varities who found that in a large representative sample of Americans in their 30s and 40s, a single year’s income correlated 0.31 with IQ, but averaging income over many years increased the correlation to 0.36. When Dalliard looked at the correlation in only men (thus, also sidestepping the complication that many women earn their lifestyle as wives instead of through direct income), the correlation leaped to 0.48 (virtually identical to the 0.49 correlation I also found by sidestepping these two problems). Now Donald Trump claims to be worth $10 billion, but as a master of self-promotion, that figure might be wildly exaggerated. Authoritative Forbes magazine (the gold standard for wealth valuation), recently put his net worth at $4 billion. However New York Times journalist Timothy O’Brien claimed in 2005 that Trump’s net worth is a measly $200 million, though Trump sued O’Brien for claiming this. However Trump multiplied his inheritance many times over, so his IQ is likely higher than an inheritance billionaire (IQ 114), but lower than a self-made billionaire (IQ 136). I’m guessing his IQ is around 125, which is higher than 95% of White America, but even that isn’t always enough. Trump recently got severely criticised for minimizing John McCain’s war hero status, which was a colossally stupid mistake for someone running as a Republican. Trump has been surging in the polls because he was willing to insult anyone, but I suspect he miscalculated in this case, and it will hurt him, and it’s a mistake I don’t think he would have made had his IQ been 10 points higher. IQ is much like money. No matter how much you have, you never get to a point where you don’t need more. As the great J.P. Rushton once explained to me, all of us have successes, all of us make mistakes, but high IQ people tend to get further ahead in life, partly because they make fewer mistakes. The brilliant Charles Murray is finally wrong about something. It’s a bum rap. All high-quality academic tests look as if they’re affluence tests. It’s inevitable. Parental IQ is correlated with children’s IQ everywhere. In all advanced societies, income is correlated with IQ. Scores on academic achievement tests are always correlated with the test-takers’ IQ. Those three correlations guarantee that every standardized academic-achievement test shows higher average test scores as parental income increases. What Murray is saying, obviously, is that rich kids do well on the SAT because they have high IQ genes and the rich environment they were raised in has little effect. I’d hate to throw Charles Murray under the bus, because he along with Steve Sailer really paved the way for people like me to talk openly about behavioral genetics, but in my scientific judgement, he’s wrong. On the combined verbal and math section of the new SAT, kids from homes earning over $200 K a year average 1157 while kids from homes earning less than 20 K a year average 895. On a scale where the U.S. mean is set at 100 (SD = 15) these scores are equivalent to IQs of 118 and 100 respectively (note only the most academic third of America tends to take the SAT so scores are high). That’s a difference of 1.2 standard deviations in kids coming from homes that are 3.07 standard deviations apart in normalized income. 1.2/3.07 = 0.39, suggesting the correlation between SAT scores and the income of your parents is about 0.4. But even 0.4 is an underestimate, because among rich kids, taking the SAT is very common, but among poor kids with little hope of affording college, it’s largely the best and brightest who take the SAT, so if everyone took the SAT, the correlation between SAT scores and your parents’ income would be well above 0.4. But 0.4 is widely cited as the correlation between IQ and one’s own income (see Jensen, 1998). One would expect IQ to correlate much less with your parents’ income, because a teenager’s IQ correlates no more than 0.6 with the mid-parents’ IQ; thus the correlation should be 0.4(0.6) = 0.24. Instead, if the SAT is used instead of an official IQ test, it’s almost double that. Clearly, the SAT is culturally biased in favor of kids from rich homes (and probably educated homes) and biased against kids from poor (and probably uneducated homes). And this is not the first time we’ve seen this effect. In the Minnesota Transracial Adoption Study, black kids adopted into white professional homes scored the equivalent of IQ 95 on measures of scholastic aptitude and achievement, but scored an IQ of only 84 (about the same as black Americans raised by their biological parents) on the WAIS (an official IQ test). What this suggests is that the SAT probably underestimates the ability of kids from low SES homes, and overestimates the ability of kids from high SES homes. I’ve even noticed this with celebrities. Bill Cosby, Howard Stern, and Rosie O’Donnell have all come from low SES homes and have all claimed to have scored poorly on the SAT, but all strike me as highly intelligent. By contrast George W. Bush did well on the SAT and comes from an extremely high SES background, but does not strike me as intelligent. The SAT would probably better reflect IQ if scores were corrected for SES, but one must be careful not to over-correct, because over half the test’s correlation with such measures is probably genetic. Sometimes I get really depressed by the evil of human nature. It seems like for a lot of middle income youths, beating the crap out of some poor defenseless homeless person is entertainment. This shows that if you don’t have money, society looks at you as subhuman, worthy of being kicked around and in some cases even urinated on. But there’s also something Darwinian about it. Those who can’t adapt to the environment (i.e. earn money) are victimized by those who can. We see this all over the animal kingdom but humans are unique in that they are one of the few animals that victimizes the weak just for the sheer sadistic pleasure it gives them, while other animals victimize only for food. Some people like to talk about how the rich are evil because they make their money by exploiting the middle income earners, but it’s the middle income earners who go around beating up and urinating on the homeless. You don’t see millionaires going around beating up and urinating on average Americans. Nor do you see billionaires like Bill Gates and Warren Buffet beating up and urinating on millionaires. I suppose Marxists would say they do it metaphorically. A lot of middle income people adopt the self-serving philosophy that the poor are poor because of stupidity and the rich are rich because of evil, and only they, the middle income people, have both brains and morality. But I think this only half true. Yes, the rich are probably more evil than middle income Americans (on average), but they’re also probably a lot smarter. And yes, the poor are probably a lot dumber than middle income Americans, but they are also probably a lot less evil. So just as middle income Americans look down at the homeless for being stupid, the rich can also look down at the middle incomes for being stupid. And just as the middle incomes can look down at the rich for being evil, the homeless can look down down at the middle income for being evil. Occam’s razor implies that whatever positive or negative traits associated with money probably apply about as much as to those who are richer than you as to those who are poorer than you. The video below, where a homeless person offers a middle income person a hug after getting beat up, demonstrates the superior morality of the homeless over the middle-income Americans that torment them. Though Cosby is a prominent education advocate, he was a terrible student in school, opting to be the class clown instead of studying up. Because he never opened his geometry book, Cosby, who had the highest IQ in his grade, once took 12 pages to work out one of four problems on a test. He ended up getting that one right, but failed the test because he didn’t have time to attempt the other questions. The SATs? He scored a 500 total. Critics of IQ tests (and even supporters like the Lion of the Blogosphere) often claim that IQ correlates with success, not because high IQ people behave intelligently in real life, but because you need to score high on the SAT (a disguised IQ test) to get into a good college to get into a successful career. In other words, test scores become a self-fulfilling prophecy, skeptics charge. But Cosby is an example of someone who had the highest IQ in his grade and went on to become the richest and most popular African American of his generation despite flunking the SAT and attending a crappy college. In other words, he did well on the IQ test that didn’t matter, yet flunked the IQ test used for college admissions, yet still achieved spectacular success. This would indicate that IQ scores predict success because they predict intelligence, and not because they predict all important SAT scores. An interesting study would be compare the future incomes of kids who flunked their SAT but did well on a regular IQ test with kids who flunked a regular IQ test but did well on the SAT. If the SAT > regular IQ test group was not more successful, then the “IQ scores are a self-fufilling prophecy” theory is debunked. Evidence continues to debunk the popular idea that IQ is largely irrelevant to success above 120, and my less successful readers are going absolutely ballistic. The reason this idea is so popular (and its debunking so threatening) is that the internet is crawling with people who are either only moderately intelligent or only moderately successful; and they take comfort in believing they achieved their modest success by being way smarter than the homeless guy on the street, but hysteria ensues if you suggest that some gazillionaire pizza mogul is richer than they are because of brains. Thus, these self-serving elitist snobs want IQ and money to be correlated, but only up to either their level of money or their level of IQ (whichever comes first). This allows them to feel intellectually superior to the poor who they view as too dumb to meet basic needs, while also feeling morally superior to the rich who they view as greedy and ruthless. Unfortunately for the hypocrites, statistics seldom work that way. There’s a popular idea, promoted by Malcolm Gladwell, that IQ only matters up to about IQ 120. In a previous post I showed that at least when it comes to income, IQ continues to substantially predict success well above 120. But perhaps the idea of an optimum IQ is correct, but Gladwell just set the bar too low. The smartest person I have ever corresponded with (a Promethean with an IQ around 180) insisted that the optimum IQ was about 130, and that not only were additional IQ points beyond 130 unhelpful to success, but that they actually might be harmful. He argued that up to half the people he knew with IQ’s above about 150 were failures by conventional standards working in unskilled jobs or not working at all and living off welfare. I found this very hard to believe, because from a Darwinian perspective, intelligence is the overall cognitive ability to adapt situations to your advantage (problem solve), so the idea that one could be so cognitively adaptable that one was maladaptive was paradoxical indeed. But that’s a philosophical argument; what does the actual data show? For the first time we actually have data thanks to a longitudinal study of kids who before age 13 scored above the one in 10,000 level for their age group on either the verbal or math section of the old SAT. How this study knows what the one in 10,000 level is for 12-year-olds, I’m not sure, since so few 12-year-olds take the SAT, but I guess they assume they’ve tested virtually all the brightest ones in the country. Now, a score above the one in 10,000 levels implies an IQ of 156 or higher, so on average I’m guessing these kids were IQ 158 (one in 20,000 level) on either the verbal or math section. However since they averaged IQ 158 on only one section of the SAT, their IQs on the overall SAT would probably regress a bit to the mean, though not too much, since the overall SAT probably correlates above 0.9 with either subscale. Thus their overall IQs were probably 0.91(158 – 100) + 100 = 153. So how successful were these kids by the time they were in their 30s? Table 1 in this paper reports that they created lots of art work, publications, and inventions, but the bottom line is that their primary annual incomes ranged from a pathetic $1,200 to a stratospheric $1,400,000, with a median of $80,000. Now if you read the small print beneath Table 1, it states that these dollar amounts were collected when they were 33, and have not been adjusted for inflation. So let’s adjust for inflation. $80,000 circa 2002 is like $106,000 today. In other words, adjusted for inflation, the median of this highly gifted group was more successful than 95% of American 33-year-olds today. According to scholar Arthur Jensen, the correlation between IQ and income is 0.4, so we should expect people with IQs of +3.53 Standard Deviations (SD) to have NORMALIZED incomes of 0.4(3.53 SD) = +1.41 SD. They actually exceeded this expectation because if we force income to fit the bell curve, then the 95 percentile is +1.73 SD. So this idea that IQ has diminishing returns above 120 is simply wrong in a purely statistical sense. In fact I see no evidence of diminishing returns even above IQ 150. The only proviso I would add is that the kids were tested quite young (age 13) so it’s possible their adult IQs regressed to the mean, although the book The Bell Curve argued that IQ was essentially stable within measurement error beyond age 10; but we’re told from other research that IQ becomes more genetic post-puberty and in later maturity, so it’s quite possible that the IQs of these kids regressed well below 150 as genes loom larger in adulthood. However if the IQs of these kids regressed to the mean, then that makes the correlation with their incomes even stronger, since the two variables would more closely match in normalized standard deviation units, however we’re still left wondering how much money Americans with adult IQs above 150 are making.